Leif Segerstam (b. 1944) received diplomas from the Sibelius Academy in violin and conducting. He won the Maj Lind Piano Competition in 1962 and gave his first violin recital in 1963. He rounded off his studies at the Juilliard School in New York, where he was awarded a conducting diploma in 1964. Segerstam was Chief Conductor and Music Director of the Royal Opera in Stockholm from 1970-1972 and Director of the Finnish National Opera in 1973-74. Since then he has conducted in most of the world's leading opera houses. Segerstam was Chief Conductor of the Austrian Radio Symphony Orchestra from 1975 to 1982 and of the Finnish Radio Symphony Orchestra from 1977 to 1987. He was Music Director of the Staatsphilharmonie Rheinland-Pfalz from 1983 to 1989 and was appointed Chief Conductor of the Danish Radio Symphony Orchestra in 1988. In autumn 1995, he was reappointed Chief Conductor of the Royal Opera in Stockholm (until 2001) and became Chief Conductor of the Helsinki Philharmonic Orchestra. In autumn 2007, Leif Segerstam stepped down to become the Helsinki Pilharmonic Orchestra's Emeritus Chief Conductor. 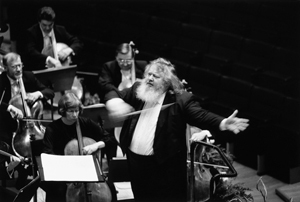 From autumn 1997, Leif Segerstam has been Professor of Orchestra Conducting at the Sibelius Academy. In November 1998, The Nordic Music Council NOMUS awarded the 1999 Nordic Council Music Prize for his work "as tireless champion of Scandinavian music". While pursuing his conducting career, Segerstam has also produced an extensive oeuvre as a composer. In addition to the many recordings featuring him as a conductor, Ondine has also released two CDs of his compositions.